Am I a Pteridologist, or a Pteridomaniac? I was looking through my old photos to see what triggered my interest in ferns. The photos show a tendency towards structural things, those not of family and friends. Buildings, trees, vehicles and latterly ferns. We used to visit a lot of National Trust properties with the kids and I think my first fern purchase probably came from one of them as a memento. In the mid ‘Noughties’ we had our front garden landscaped and had to re-plant the whole area. 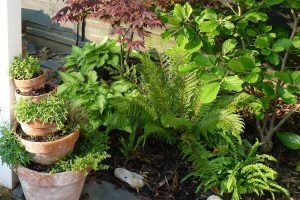 I acquired a small plot for the few ferns I had in containers and planted them out eagerly. The site was in the shade but above the root system of 2 vast Laurels that had once been the hedge, and a tall conifer. Not ideal. 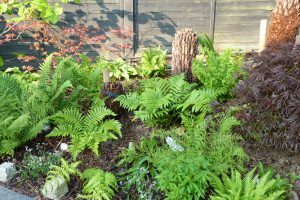 Every spring copious watering would bring the ferns back to life again and continuous watering kept them lush for the summer months. I always looked forward to seeing those first croziers peek out and unfurl. They fascinated me. From about the year 2000 to 2010 my random collection grew to over 20 different species and cultivars with purchases at other NT houses and at Hampton Court RHS Flower Show, mainly bought from two guys that call their company ‘Fernatix’. 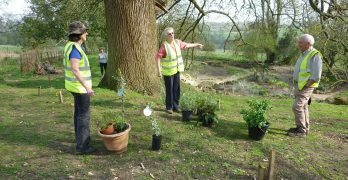 In 2009/10 we landscaped our back garden, with patio, water feature and fish pond, and I moved the main collection to two new areas. Leaving just a couple of large Blechnum nudum out front, the remaining plants were split between the small area next to our patio and a larger area below the pond. 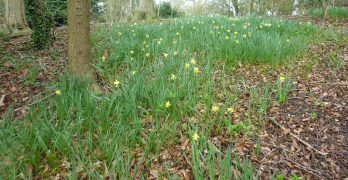 Both are on the southern boundary and shaded by a tree or the tall hedge. Masses of organic material was, and still is, dug in to keep the soil moist. 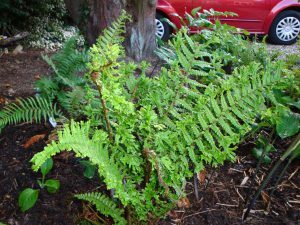 Pride of place was given to the Polystichum setiferum ‘Plumosum Bevis’, a very darkly attractive Soft Shield fern. The interest in collecting leads naturally to wanting to learn more about ferns; to see, photograph and uncontrollably purchase more. I am a besotted and incurable ‘fernatic’, or what the Victorians called – a Pteridomaniac! In the last 10 years I have taken over 3 further areas of the garden, the most successful being the shady and sheltered unused strip along the side path. A few years back my wife and daughter, visiting the Chelsea Flower Show, saw a stand run by an organisation with an unpronounceable name. Deciding that it would be a good joke, they signed me up for membership of the British Pteridological Society. The regular publications started arriving, 3 different formats of newsletter plus emails, and I eventually got to this year’s AGM. I was fearful that the number of ‘Dr.’ prefixes in the organisation would make for a very academic day. Far from it. The day included a reasonably short formal AGM, some interesting presentations and slide-shows, a sale of BPS branded goods and a spore exchange. I met nice people with a similar interest, but often a far greater knowledge of ferns than I have memory capacity for. Having recently visited two couples in Norfolk who are Pteridoligical Society members I realise my collection, and my retention of details, is woefully short of optimum. So I consider myself a Pteridomaniac, rather than a Pteridologist, enjoying collecting ferns and learning what I can from browsing books and catalogues. 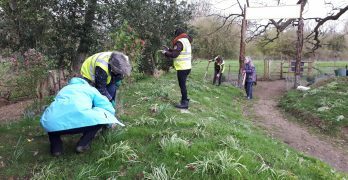 I hope to help the Friends’ of Danesbury Local Nature Reserve community that have welcomed me with open arms, and occasionally get the name of a fern correctly identified. I look forward to seeing you all at working days at Danesbury as often as I can make it.